Optometrist in Burbank, CA | Burbank Optometric Center, Inc.
Our entire Burbank team is committed to providing world class eye care and legendary, memorable service. Our Burbank office provides a wide selection of contact lenses to suit every lifestyle and personality. Welcome to Burbank Optometric Center, Inc. Here at Burbank Optometric Center, Inc., we are proud to serve San Fernando Valley, Burbank, Glendale, Pasadena, North Hollywood, Van Nuys and Toluca Lake. Our team of professionals is dedicated to giving our patients the highest quality of optometry care. We offer a full range of optometry services so all of your family's needs are met under one roof. If you are looking to brighten and enhance your vision, please don’t hesitate to contact us today at (818) 845-3549! Dr. Nashida was lovely and felt like she really wanted to get to know me. They spent a lot of time with me picking out frames - I was on a budget, no insurance and they really made it work. I'm very happy with my frames!! Best Optometrist!!!! We've been patients for 12 years and highly recommend them everytime!!! Comfortable, kind, educated, intelligent, perfect. Fantastic for emergencies also. We come straight here for our eye injures and illnesses. Im very happy with Burbank Optometric they have met all my eye needs an Dr Nishida an all her staff are very nice. Best doctor in town. Knows how to work with kids. My son started vision therapy and he loves coming here. Saturday: By appointment only. Please call for availability. 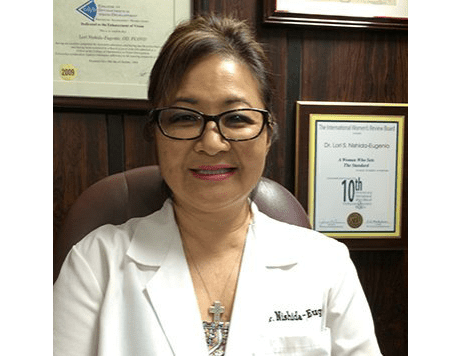 Dr. Nishida-Eugenio is a developmental optometrist and owner of Burbank Optometric Center, Inc. She is a 1992 graduate of the State University New York College of Optometry, one of the most prestigious schools for vision therapy. She earned her Fellowship in Vision Development in 2007. She provides a wide range of eyecare services including testing for learning-related vision problems, vision therapy for strabismus and amblyopia for adults and children, specialty contact lens fitting, diagnosis and treatment of glaucoma, cataract co-management as well as LASIK co-management.